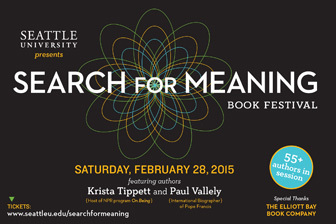 Yesterday I attended Seattle University’s Search for Meaning Book Festival, which has brought together readers and writers of spiritual books every February for a number of years. The event gives many authors a chance to sell and sign books, and readers have a chance to speak directly with writers about their work. But what I value most are the workshops and keynote addresses. My favorite this year was a presentation by Timothy Radcliffe OP entitled “How Can Christians Touch the Imagination of Our Contemporaries?” The presentation was built around the French film Des hommes et des dieux (Of Men and of Gods), which recounts what happened to eight Trappist monks in Algeria when work at a monastery was interrupted by terrorists. Actual events that inspired the film occurred in 1996 at the monastery of Tibhirine. The film, said Radcliffe, is an exploration of the beauty of our faith as these men “embark on a terrible adventure that may cost them their lives.” That they seem ordinary people, with similar fears, feelings, and opinions to our own, is one key to the appeal of the film and its ability to touch the imagination of people of our times. Evoking a sacramental imagination is another key. Religious sacraments resonate widely throughout Western culture, even among unbelievers, so the monks’ Last Supper touched a chord for viewers. Another is the paradox that as the men became more Christ-like in the course of the film, they became at the same time more different from each other. Radcliffe’s point was that a Christian identity does not make us all the same but actually more differentiated as we each become the person we were intended by God to be. Having seen only the four short clips shown during the presentation, I am eager to get my hands on the film in its entirety and urge you to see it too.